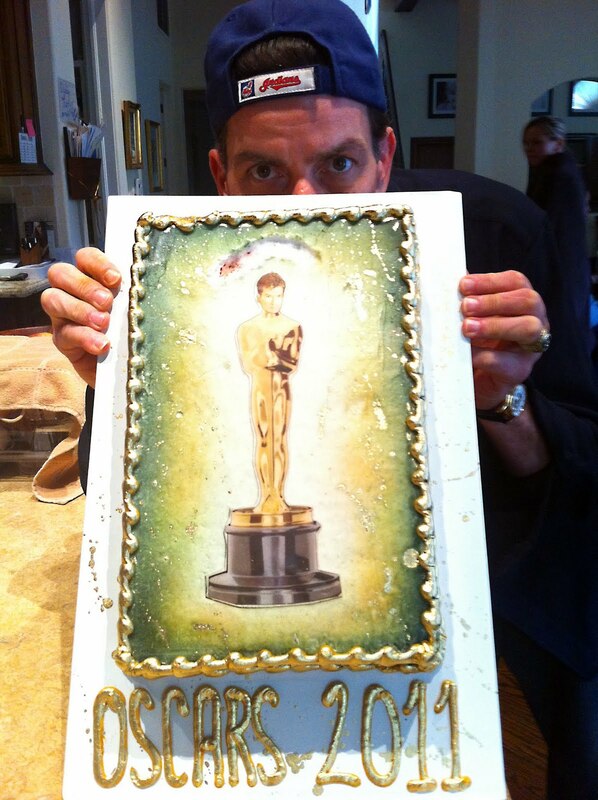 Recently, actor Charlie Sheen has been all over the place and he has been on a bit of a rampage. Just this evening he started his own live online TV show named Sheen's Corner. Charlie recently had some challenges with his x-wife and he seems to have decided to go full-regalia into bachelorhood. Charlie Sheen is pictured below with one his live-in girlfriends named Rachel Oberlin, who he refers to as one of his Goddesses. Charlie is wearing what is probably the most elegant, timeless watch ever made. 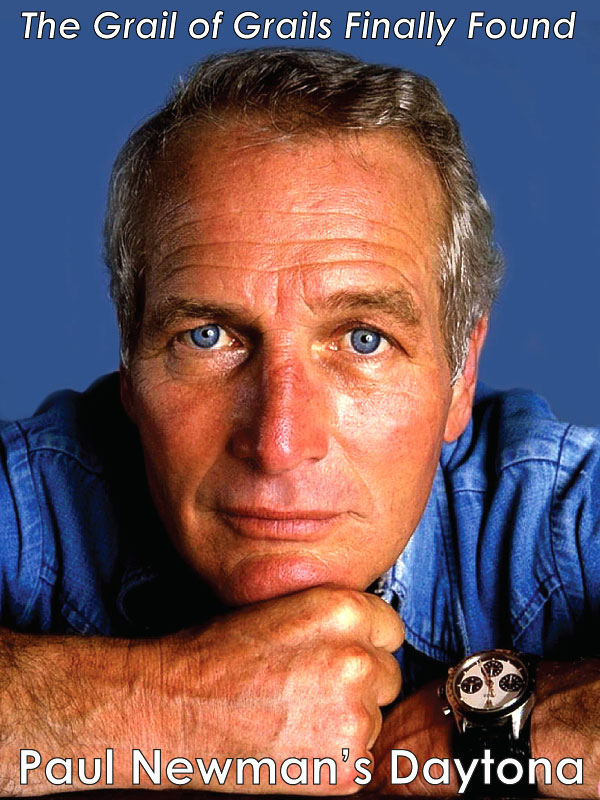 He is sporting an EXTREMELY RARE Yellow gold Patek Philippe 2438J, Complicated Moonphase that was made in the late 1950s through the mid 1960s. 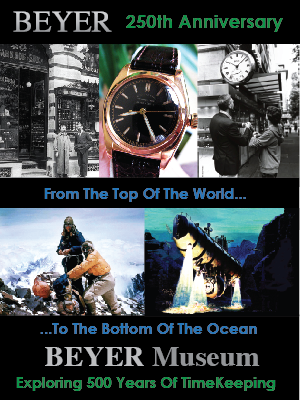 Charlie Sheen's Patek Philippe Moonphase photo above actually looks like one of Bernhard's Sneaker and Pant Wrist Shots!!! 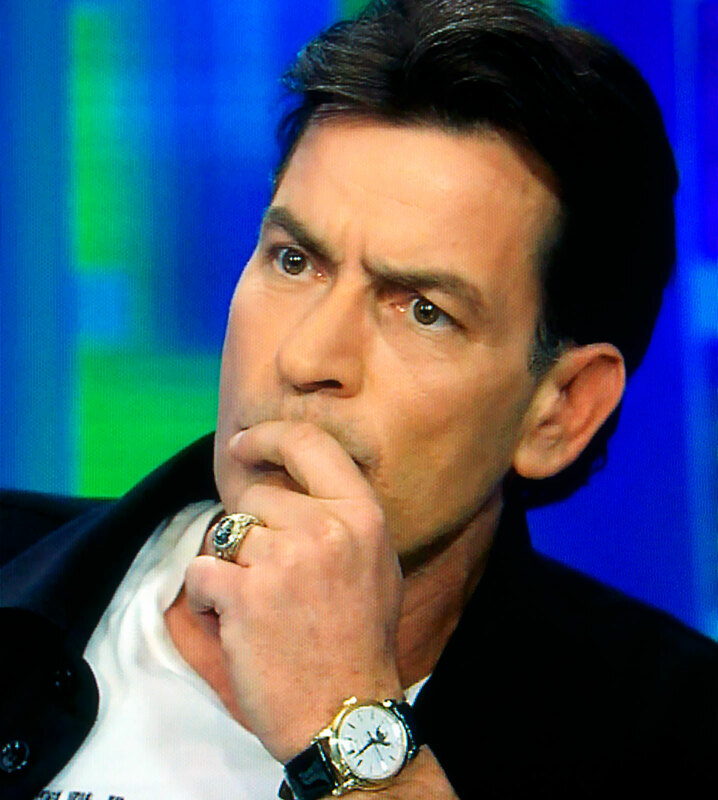 So just how rare and valuable is Charlie Sheen's Patek Philippe Moonphase? Somewhere between $500,000 and $750,000!!!! 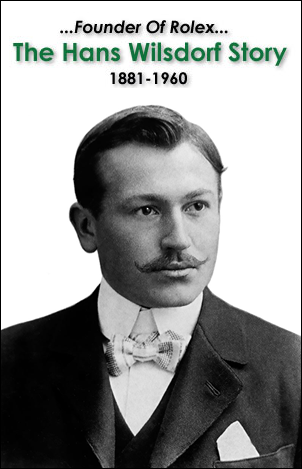 Update: Patrick who is a daily reader of Jake's Rolex World, just pointed out that Charlie's Patek says the date reads, TUE (Tuesday), FEB (February) 29th, but there is no February 29th, 2011, so it is possible Charlie did not set the leap year setting, or now that I think about it, I think on this model, it probably lacked the leap year setting complication. Maybe that is what makes it a "Warlock" watch, in that he gets another day, we don't? 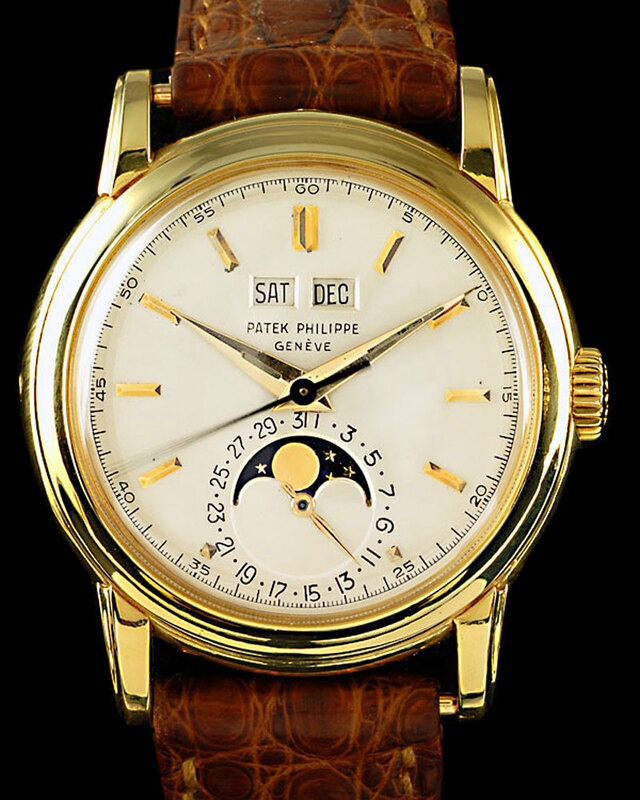 The next three photos below are of a very similar watch to Charlie Sheen's 18kt Patek Philippe Perpetual Calendar Moonphase which is a reference 2438J which was made in 1959. Its case measures 37mm in diameter and 13mm tall. 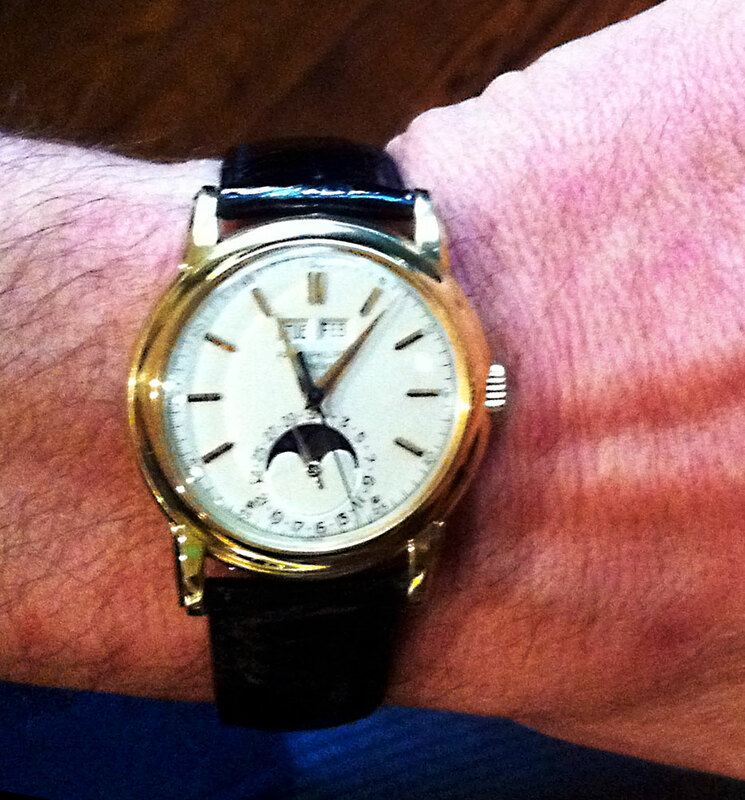 One of my favorite features of the moonphase watches from the 1950s is the dauphin hands. Dauphin hands are shaped like an extended pyramid and they are not only timeless, but have a distinct Art-Deco "Populux" design. 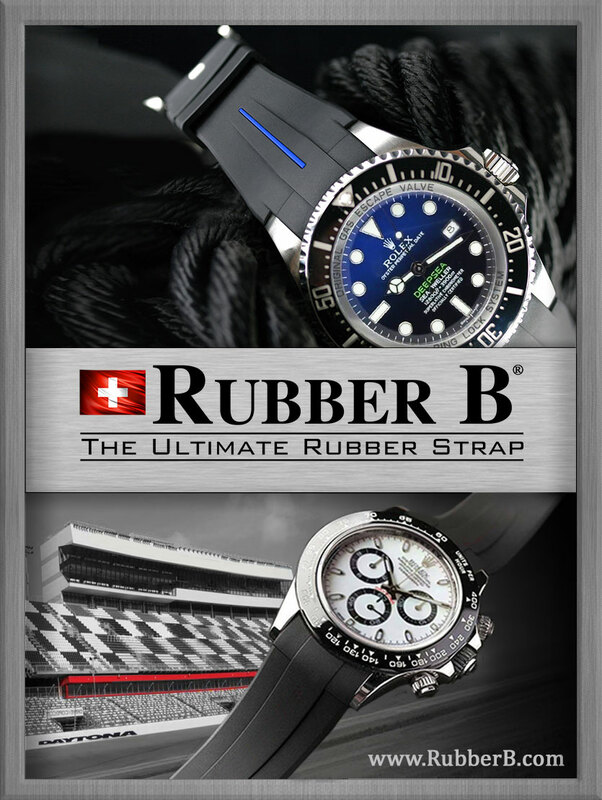 Charlie Sheen is obviously wearing this watch on a black strap, but it sure does look great on the honey-rust crocodile strap!!! 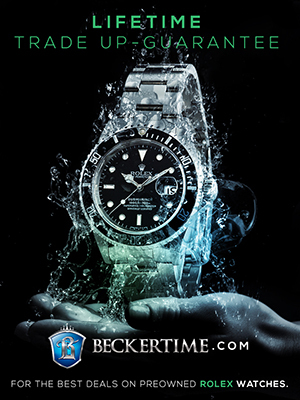 What a timeless, beautiful, elegant watch!!! 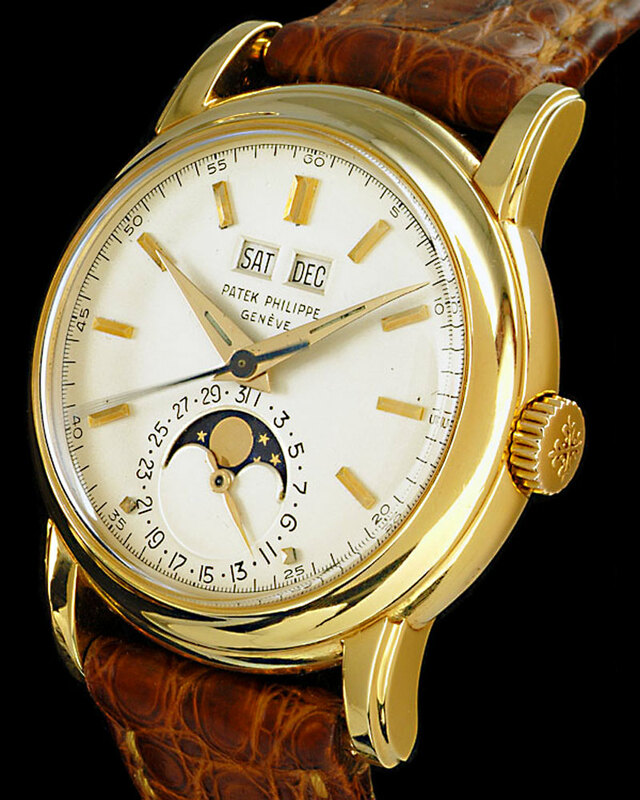 In my personal opinion, Charlie Sheen's Patek Philippe is the most beautiful, well designed watch ever made, and if I could have any watch ever made in history, but I could not ever sell it and I had to wear it at least 3 days a week I would choose Charlie Sheen's Patek Moonphase, but there is one other watch I might choose over Chalie's Patek Moonphase, and put heavy emphasis on the word might, because it would really almost be a tie. 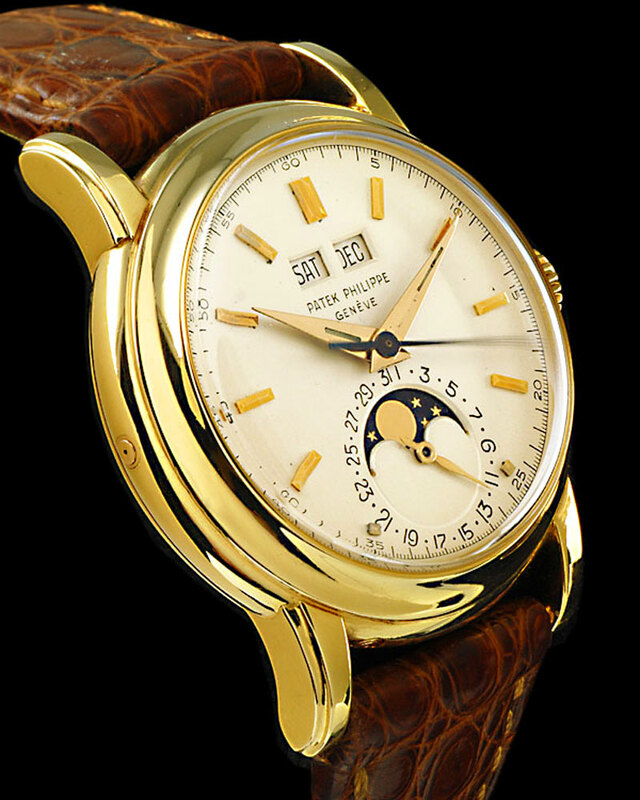 The only watch ever made on planet earth that I think might be better than Charlie Sheen's Patek Philippe Mooonphase would be the 1952 Rolex 6062 Moonphase pictured below. 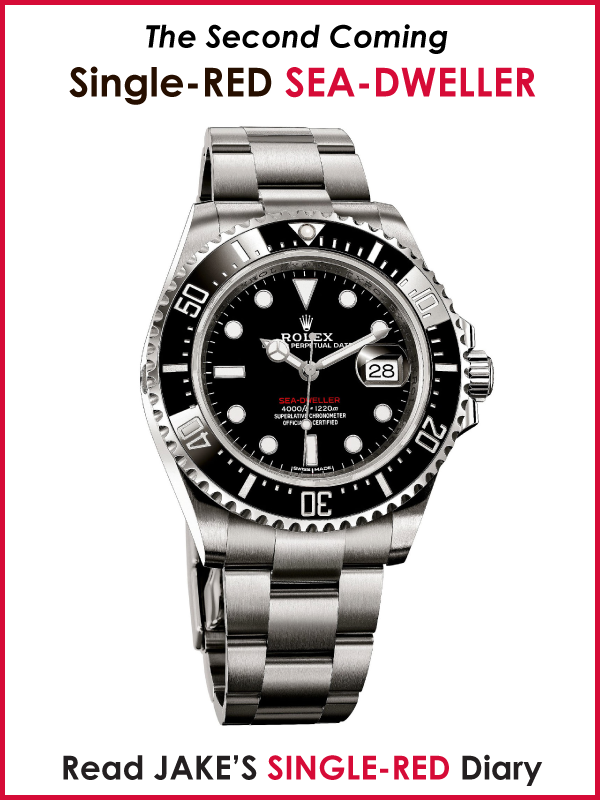 Why Rolex does not bring this watch back to life is so far beyond me!?!?!?!?!?! 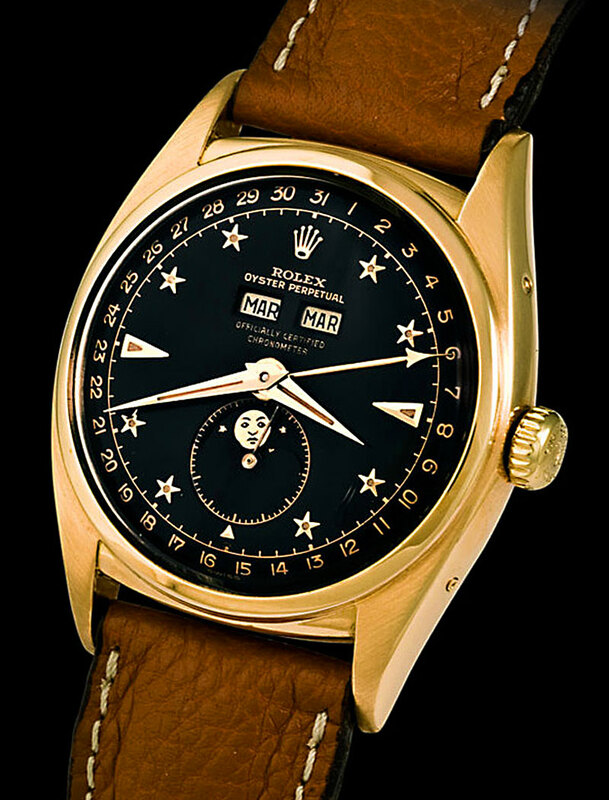 Rolex design, if you are reading this, please, please, please bring back this watch!!!!! Don't change anything just make it 40mm. 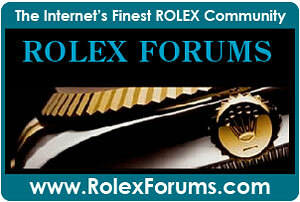 So why might I chose this Rolex Moonphase over Charlie's Patek? 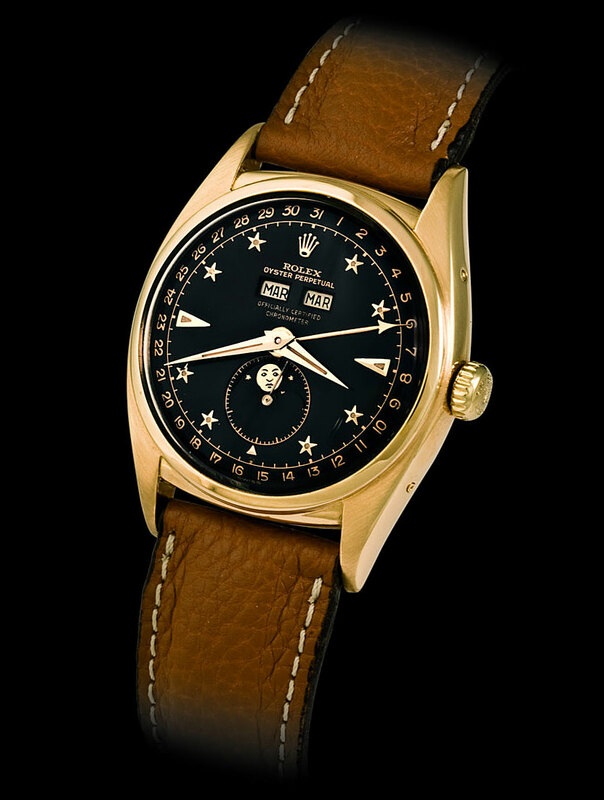 I like the dark black dial and I love the star markers. 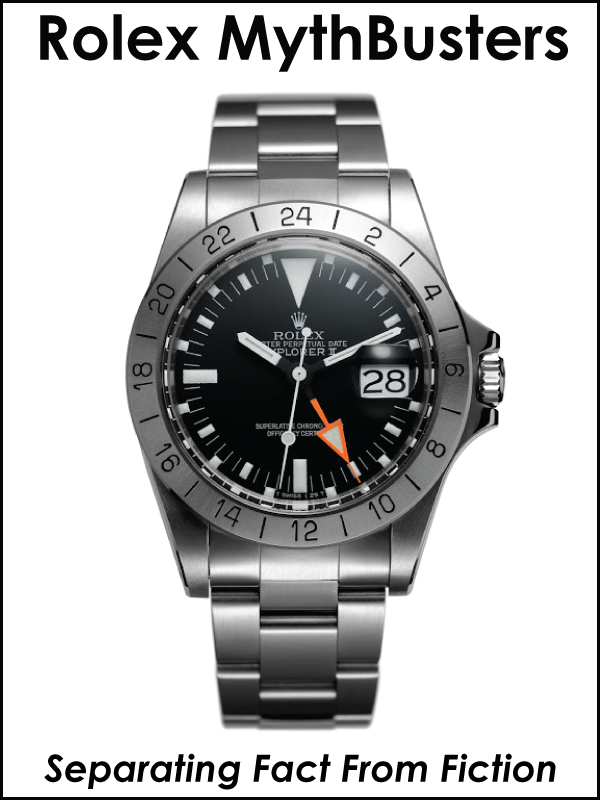 I also kind of dig how the date ring runs around the outside of the dial, giving is a more sporty look. 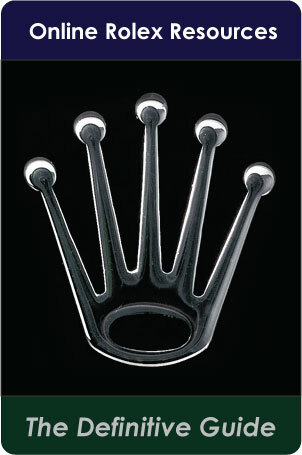 Ironically, I think I like the shape of the Rolex lugs and case better, but it is probably a close tie. 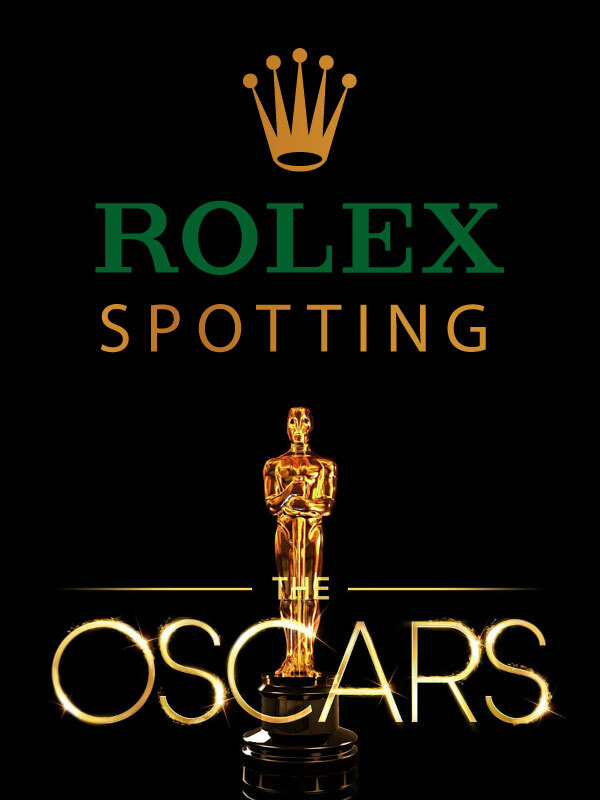 Basically, Charlie's Patek Moonphase [Reference 2438J] and the Black Star Dial Rolex Moonphase [Reference 6062] are my two Grail watches!!!!! 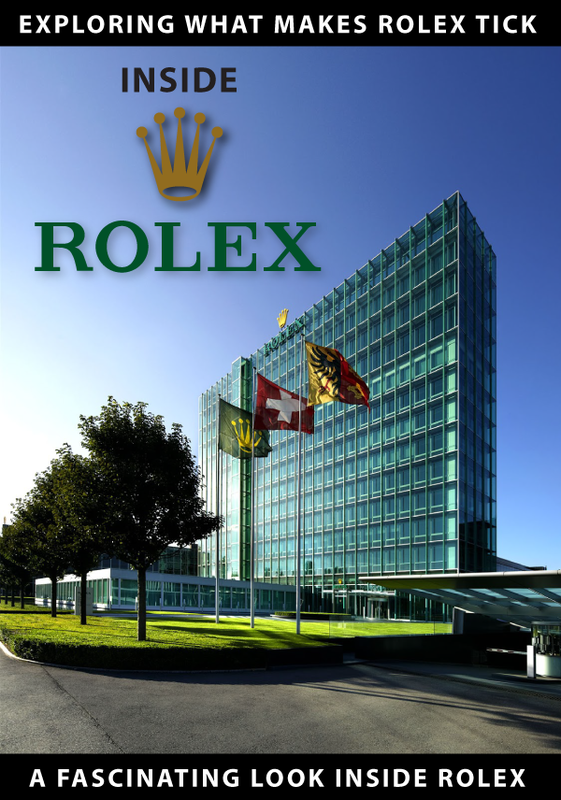 If you are not familiar with Patek Philippe watches, if Rolex watches are considered to be the Mercedes-Benz of watches, Patek Philippe's are considered to be the Rolls Royce of watches. 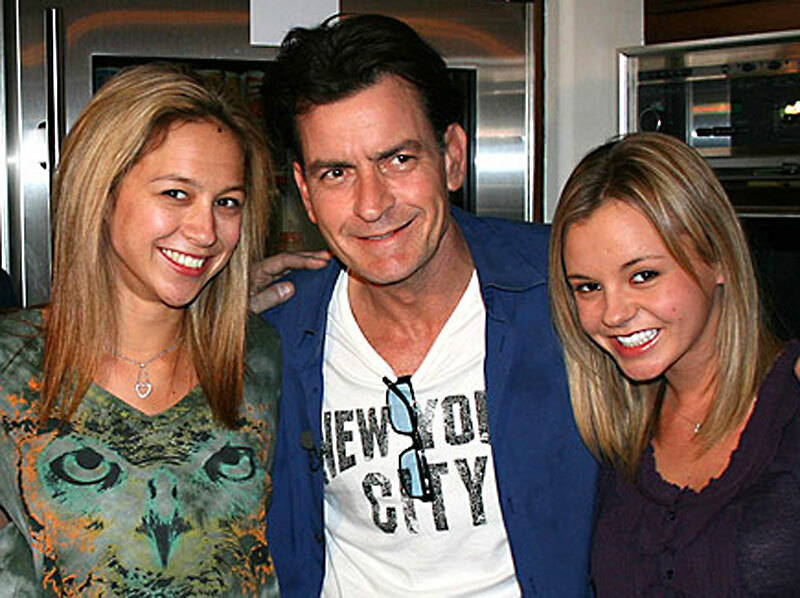 Charlie Sheen refers to his girlfriends as his Godesses and he is pictured below with Natlie Kenly on the his right side, and Rachel Oberlin on his left side. Some people think Charlie may be losing his mind. It looks to me like he is just having a really good time, and if you ask me, any dude who wears a Patek 2438 is alright by me. 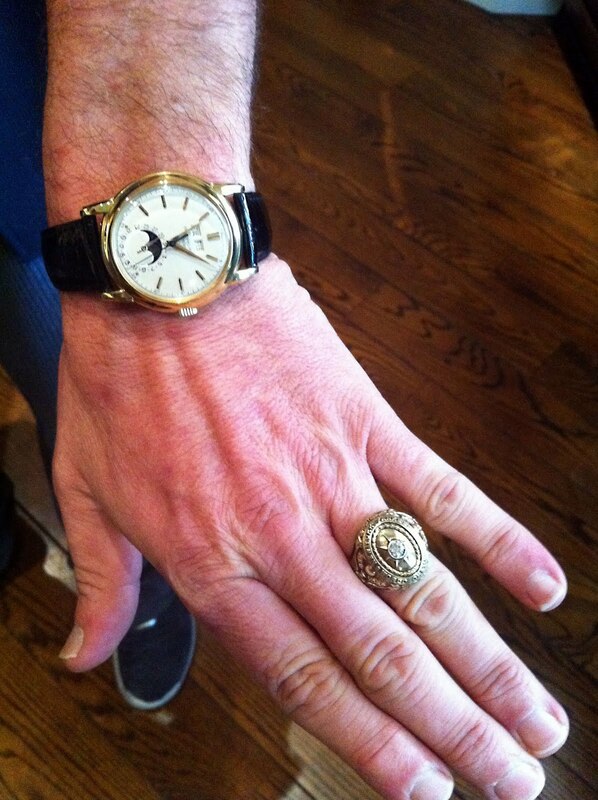 Of course Charlie Sheen is a complete WIS and he also wears a Rolex Yacht-Master.